I haven't seen it, but reviews on It are mostly positive. However, some movie buffs I follow had mixed responses. They said it's a hodge-podge, a "curious mess" (which is much like the book). The characters are given scary scenes with real horrors like child abuse, nightmares, alcoholism, animal abuse, gun threats, pedophilia, psychological drama, etc. And then a clown shows up. So we got some tonal dissonance here. I had a feeling this might happen as soon as I saw the new design for Pennywise. It's just too scary. And thus, it's not scary. In 1986, clowns were not scary. They were funny, jovial, friend to all children (like Gamera). They were Clarabell and Ronald McDonald and Marcel Marceau and Red Skelton. If you were lost, you could go up to a clown and they'd help you find your family. They were like comedy superheroes. That's why the Pennywise in the It novel was scary. Because he was a demon dressed up as something childlike and innocent. To further illustrate, we can even examine their visual designs. The clown on the left? Not scary. It looks very inspired by Bozo, the most popular clown of this era (bald, puffy red hair, high eyebrows, red nose, white makeup, circus outfit including puffy red buttons). Just looking at it, you can't tell if this clown is scary or not. It just looks like a clown. Not until the sharp teeth come out do you think something might be wrong here. The fear comes comes from its actions, not the look. It's meant to lure you in with a false sense of safety and joy, like an angler fish. (And it didn't hurt that he was played by Tim Curry who can turn it off and on like a faucet). But the clown on the right, you know immediately to run away. It doesn't even need to inside a sewer grate to know something's wrong here. I know that's not a clown, that's a murder-thing. And even if they didn't screw up the visual design, the "scary clown" is cliche now, partially due to It itself. The phenomenon originated with John Wayne Gacy. He was arrested in 1978 and sentenced in 1980, giving two years for all the sordid details to ingratiate into the public consciousness. 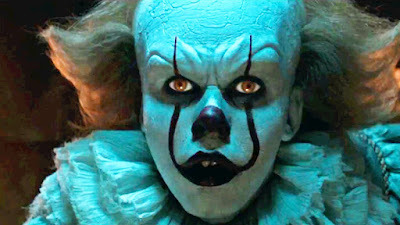 Add some time for creators to add scary clowns into their books and movies. Look at any list of scary clowns, they are ALL 1982 and later. There is nothing before that. 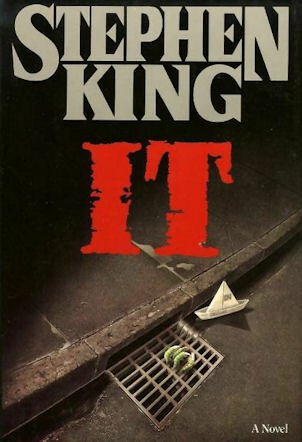 The one exception might be Bradbury's "Something Wicked This Way Comes" which was more about a carnival than clowns (but note the movie came out in 1983, at peak clown). 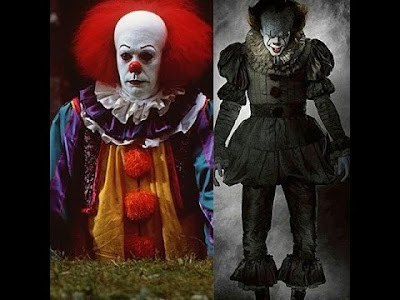 My point is, Pennywise was scary because of what he did, not how he looked. If you change his look to be scary, you miss the point.